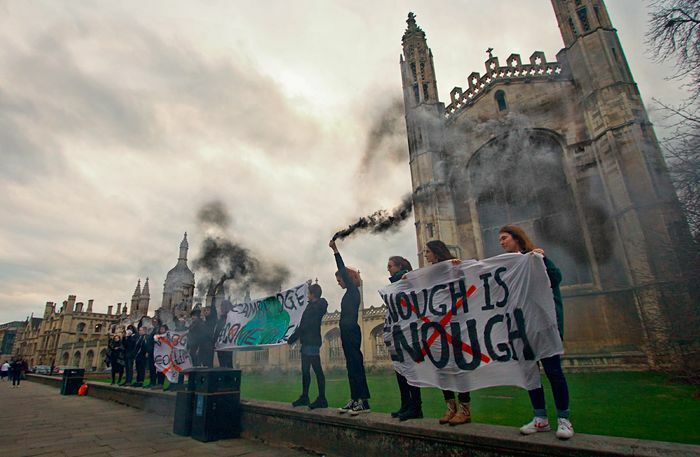 Three student societies, led by the Cambridge Zero Carbon Society, have joined forces to publish a report detailing how the University can achieve full divestment and positive reinvestment, drawing on examples of institutions that have divested from fossil fuels. The report, titled Decarbonising Cambridge: A Pathway to Divestment and Positive Reinvestment, was written by a group of 20 students from the Cambridge Zero Carbon Society, Positive Investment Cambridge and Just Love Cambridge, a Christian student community. The report has been submitted to the University’s Divestment Working Group set up in 2017, set to publish its report on the “pros and cons of divestment” in Lent. The report, led by Zero Carbon, centres on three key findings, firstly identifying three options for both partial and full divestment from fossil fuels, drawing on successful divestment of other institutions, specifically the Rockefeller Brothers Fund Investment and the universities of California and Bristol. The Rockefeller Brothers Fund Investment reduced the total percentage of financial investments in fossil fuels from 6.6% to 1.7% in 2017. The UC systems divested $200 million in coal and tar sands investments in September 2015, then a further $150 million in response to student protests and sit-ins. It now has approximately 3% of its public equity holdings invested in oil and gas drilling. In comparison, it was estimated that the University had £377,431,354 invested in fossil fuels in 2014 — 6.4% of its endowment at the time. The figure was then disputed by Andrew Reid, Cambridge’s Director of Finance until January 2018, who claimed it was less than 3.5%. While the University publicly claimed in 2016 that it had no exposure to coal and tar sands in its direct investments, negligible exposure in its indirect holdings and no expectation to invest in such fossil fuels in the future, the Paradise Papers revealed otherwise — Cambridge invested $1.7m (£1.3m) in Coller International, a private equity firm based in Guernsey. The three pathways to divestment the paper puts forward include transferring investments to an externally-managed fossil-free fund manager, moving global share investments to a low-carbon index, and putting pressure on current fund managers to place a higher emphasis on ESG and present the option of a fully divested fund. The report also highlights the University’s opportunity to be part of an energy revolution of investors reinvesting their money positively through Green Revolving or Impact Investment Funds, both of which are investment vehicles for organisations to generate beneficial social and environmental impact alongside financial returns. Daniel Zeichner, MP for Cambridge, wrote its foreword. Zeichner told Varsity, “The Divestment campaign is an important part of the battle against climate change. As the impact of rising CO₂ emissions becomes too enormous to ignore, it is clear that drastic action is required and at a much faster rate than is being taken now. Two out of the three student groups involved in producing the report have voiced a shared hope that the University will consider divestment a practical and viable prospect in light of the report’s conclusions.